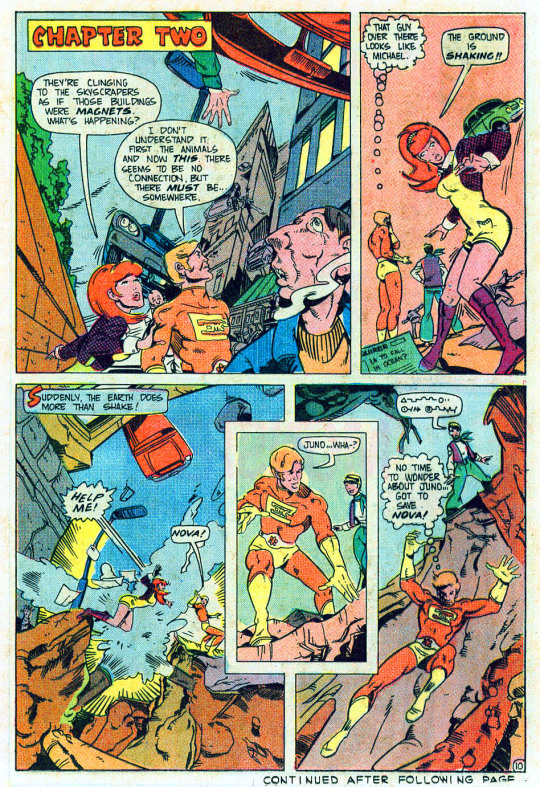 It’s pound for pound a really fun issue, though artist Joe Staton is just beginning his professional career and still shows some weaknesses and limitations–there aren’t really any backgrounds on this page, for example. 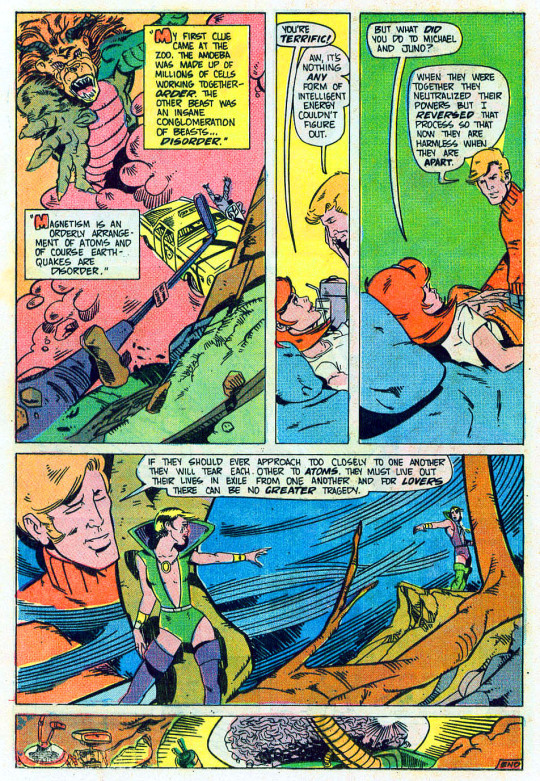 But the script by Nicola Cuti is charming and the tone is very different and much more playful than most of what was being produced as super hero comic books in the mid-1970s. whose powers represent order and disorder and which only operate when they are separated. The Brain sends them out to intercept E-Man, and they stage a chance meeting at the zoo, where Nova introduces E-Man to them under the impromptu name Alec Tronn, which would become his secret identity. After the twins depart, all hell breaks loose at the zoo, as E-Man is first attacked by a giant Amoeba, then a weird beast amalgamated from all of the zoo animals. These two menaces wind up polishing each other off, but in the aftermath, all sorts of chaos runs rampant within the city. Amidst the chaos, E-Man notices Juno speaking a strange language, but he can’t stop to question her at that moment. 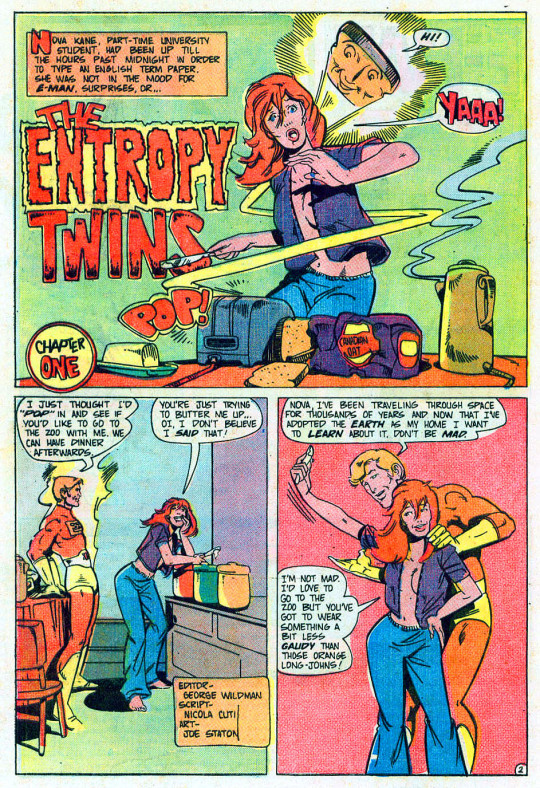 Reporting back to the Brain, the Entropy Twins reveal that they don’t want to kill E-Man, they were only sent to Earth to test their powers for the coming war. But the Brain refuses to send them home until E-M<an is destroyed. 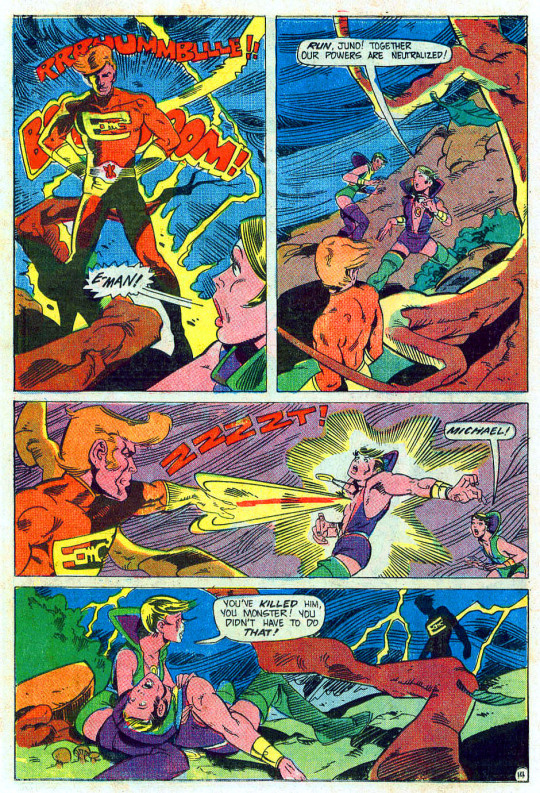 The ambivalent Entropy Twins have no choice but to seek out E-Man again–but before they can do so, the enraged energy being seeks them out, angered because Nova was injured in the chaos they caused. Uncharacteristically, E-Man brutally blasts the two youths down cold-bloodedly without a word–but all is not as it seems. 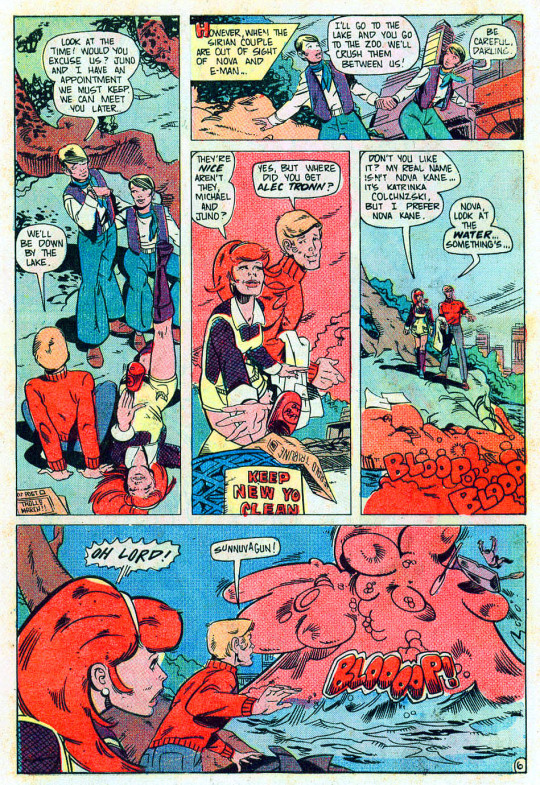 The back-up series, a real favorite of mine, is Killjoy, but Steve Ditko. It’s a comedy adventure strip, one that still espouses some of Ditko’s Ayn Rand-inspired politics, but it’s so broad and goofy and action-packed that the medicine goes down a lot more smoothly. Killjoy is a silent crime-stopper who battles his way unspeakingly through a horde of comedic super-villains. It’s implied that he has multiple secret identities, including Ed Gab, reporter, Al Ace, counter-intelligence officer and Jud Lah, litigator, but that’s hardly the point. The fun lies in watching Killjoy kick the hell out of a bundle of bad guys who all decry him stepping on their rights to be evil and corrupt. 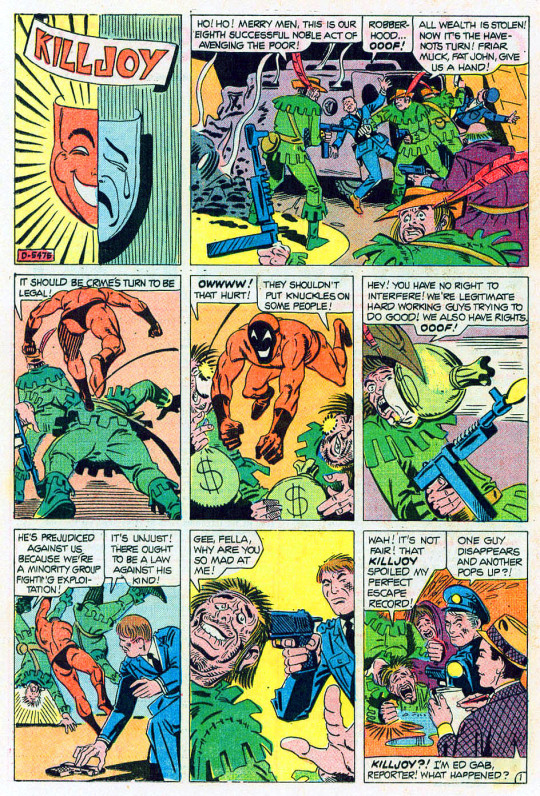 Ditko only did two Killjoy stories, I believe, which is a shame, as it was a very fun series.